Don’t wait. Today is your day to start a food blog! Put things on hold for the next 15-20 minutes and follow the three steps below. You’ll be up and running with your own food blog before you know it. If you’re asked to pick your plan level I’d suggest the Starter Plan, which is paid in one lump sum instead of monthly, but it’ll save you quite a bit of cash. You’ll also need to host your domain name. Hosting is like renting space on the web to display your blog. Bluehost has great rates and gives you your domain name for free if you decide to host with them. WordPress is a blogging software. It’s the software that I use for thethinkitchen.com. The best part is that it’s SUPER easy to use and it’s also super easy to install on your website. Hello Fellow Food Blogger! 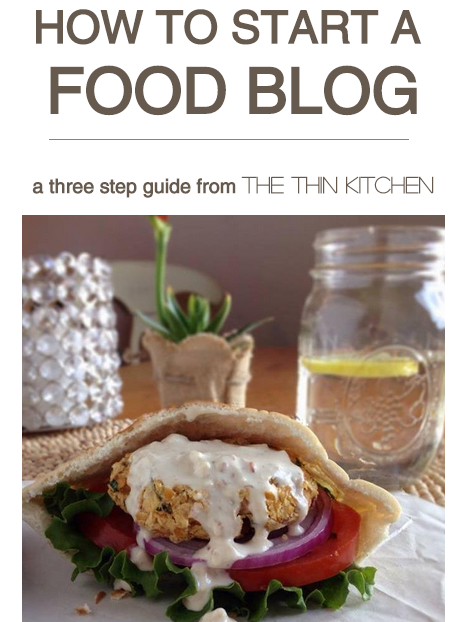 You officially have your own food blog! Now you’re able to share your favorite recipes! The Thesis Theme – Highly recommend it. The Genesis Framework – You’ll also want to look into the available StudioPress Themes, like the Foodie Theme.